This feature appeared in The Concordia Sentinel on February 21, 2001 in celebration of Black History Month. Permission has been granted to LAGenWeb Project to display this information by Sam Hanna, Sentinel Editor and Tracey Bruce, Sentinel Writer. Our deepest thanks to them for allowing us to use this information. The independent black film movement was one born of adversity. It was a movement in which Vidalia native Spencer Williams overcame tremendous odds to represent himself and his culture in his lifetime. Williams entered the film business at a time when "race movies" were being made along side the Hollywood versions. Race movies were low-budgeted and mostly aimed at black audiences in segregated movie-houses of the South and where large city black populations lived in the North. Since the making of his first film, Tenderfeet in 1928, Williams' list of film credits is extensive. His success as a black filmmaker led to his most famous and controversial role. 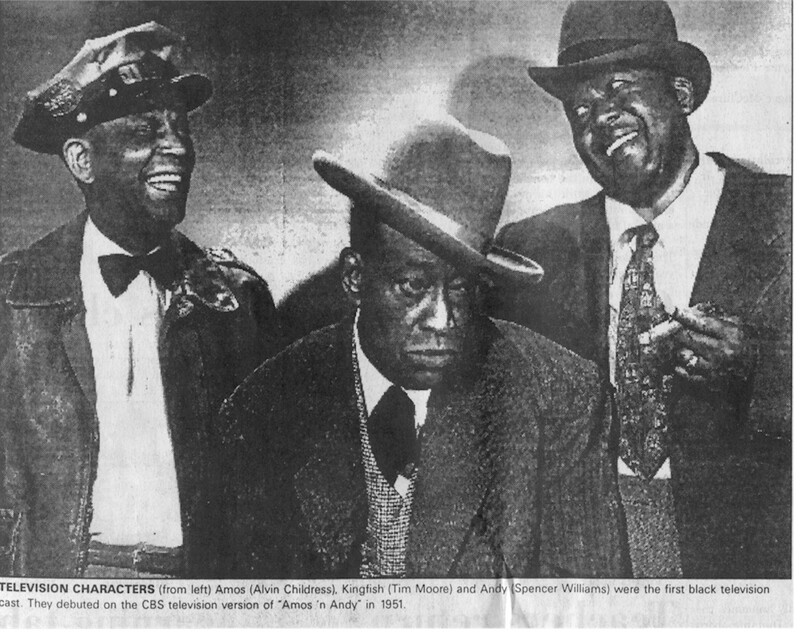 Freeman Gosden and Charles Correll, who created and portrayed the characters of the long-running radio comedy "Amos 'n' Andy," conducted a four-year non-stop search for the African-American actors that would bring their radio personalities to life. The extensive search covered 25,000 miles to audition and interview 800 candidates and even involved recommendations from President Harry Truman. Someone that remembered a writer and producer of African-American movies (Williams) brought the search to Tulsa, Okla. Tulsa's KTUL broadcast a request for information about him. A church rector heard it, promptly notified Williams, one of his parishioners. The great talent hunt compared to that of the search for Scarlet O'Hara in Gone with the Wind. It finally came to an end. Actors were discovered who resembled and sounded reasonably like the radio characters and the first broadcast was beamed around the CBS-TV network July, 1951. The show, immensely popular and controversial, was the first dramatic series to employ an all black cast. The comedy about a Harlem-based group of lodge brothers ran until 1953. The controversy continued in reruns until CBS yanked the show in 1966. The network considered it too controversial because of prolonged protests by the NAACP. Back home in Vidalia, close family friends and relatives remembered enjoying his lengthy visits. God sister Alma Brown, also nicknamed "Topsy" or "little sister" by Williams explained, "You knew he was here - he was always whistling or singing, 'Sometimes I'm Tossed and Driven.'" Brown lives next door to the childhood home of Williams on North Magnolia Street in Vidalia. "He was always very comical - teasing and telling jokes," she said. "He always kept that cigar in his mouth." Cousin Orma Jean James was a little girl and remembers visiting the household of Williams' mother, Pauline Williams Tatum, regularly. "We'd go see our famous cousin and he'd always give us money for candy," said James. "As a kid I didn't understand 'famous' but since then I've realized how talented he was." Williams list of film credits is extensive. Each credit can include one and in many cases, all of the titles - actor, director, writer, producer, composer. To his credit are Tenderfeet (1928), Melancholy Dame (1928), Georgia Rose (1930), The Virginia Judge (1935), Harlem on the Prairie(1937), Two-Gun Man From Harlem (1938), Harlem Rides the Range (1939), The Bronze Buckaroo (1939), Bad Boy (1939), Son of Ingagi (1940), The Blood of Jesus (1941), Marching On! (1943), Of One Blood (1944), Go Down Death (1944), The Girl in Room 20 (1946), Dirty Gertie from Harlem U.S.A. (1946), Jivin' Be-Bop (1946), Juke Joint (1947), Beale Street Mama (1947), St. Louis Blues (1958). 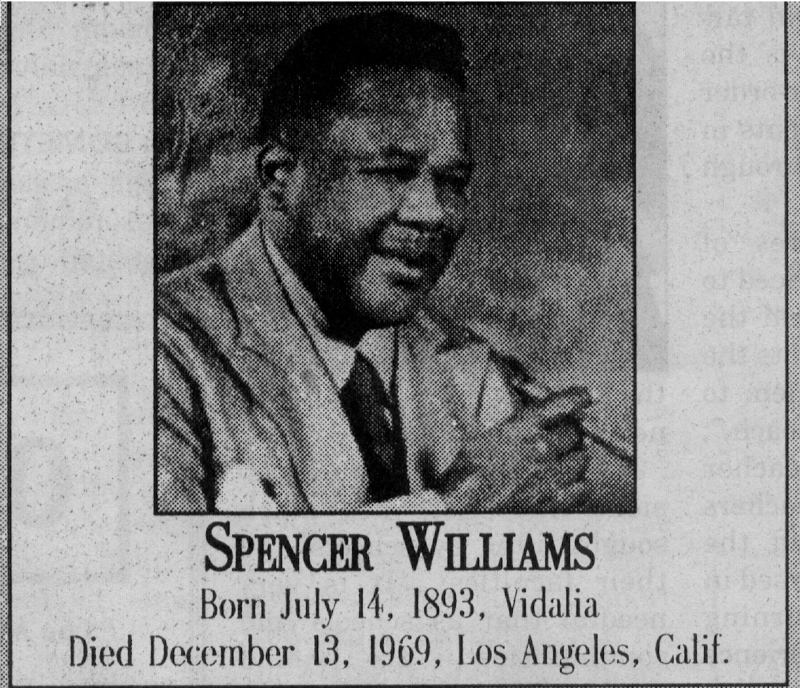 In celebration of Black History Month, Vidalia's own Spencer Williams' contribution to the film and entertainment industry merits remembrance. Vidalia economic director Linda Gardner is currently pursuing a historical marker to honor his contributions. Photos and article are © 2001, The Concordia Sentinel. Users are permitted to read and/or print this document free of charge for personal use only. No commercial use of this information is permitted without express written consent of The Concordia Sentinel.